What is the Sage Project? 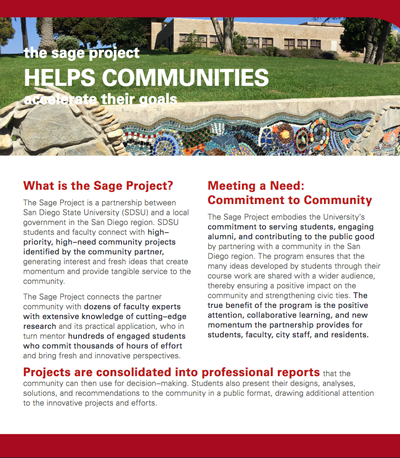 The Sage Project is a partnership between San Diego State University (SDSU) and a local government in the San Diego region. SDSU students and faculty connect with high‐priority, high-need community projects identified by the community partner, generating interest and fresh ideas that create momentum and provide tangible service to the community. The Sage Project connects the partner community with dozens of faculty experts with extensive knowledge of cutting-edge research and its practical application, who in turn mentor hundreds of engaged students who commit thousands of hours of effort and bring innovative and multidisciplinary perspectives. The Sage Project embodies the University’s commitment to serving students, engaging alumni, and contributing to the public good by partnering with a community in the San Diego region. The program ensures that the many ideas developed by students through their course work are shared with a wider audience, thereby ensuring a positive impact on the community and strengthening civic ties. The true benefit of the program is the positive attention, collaborative learning, and new momentum the partnership provides for students, faculty, city staff, and residents. We help attract positive publicity, energy, and enthusiasm for the partner community by collaborating with SDSU. Sage Project staff coordinate with the press to generate media attention and interest in the community within the community, across the university, throughout the county, and both nationally and internationally. Students can assist with community engagement, enhancing the community partner’s communication and outreach efforts. The partnership helps to revitalize or revamp stagnant projects, implement cost-savings, or improve efficiency via a dedicated group of young minds and faculty experts focused on the community’s individual projects. The work done by students is creative and reflects new and innovative perspectives for the community partner that may otherwise be unavailable due to limited time and resources. SDSU students can help to advocate and work for the community. The partnership will involve education of highly engaged students with in-depth knowledge of the partner’s community. Participating students serve as knowledgeable voices in the community who educate other students, residents, business owners, and future employers about their experiences and their contributions to the partnership. Many students have accepted community intern and staff positions as a direct result of successful collaboration through the Sage Project. Projects are consolidated into professionally prepared reports that the community can then use for decision-making. Students also present their designs, analyses, solutions, and recommendations to the community in a public format, drawing additional attention to the innovative projects and efforts.